The primary school net enrolment rate in so-called developing regions reached 91% in 2015, up from 83% in 2000. Furthermore, the number of out-of-school children of primary school age worldwide has fallen by almost half, to an estimated 57 million children in 2015, down from 100 million children in 2000. Nevertheless, primary education for all is far from being achieved by 2015. Poverty, wars and conflicts prevent children from attending schools. The lack of professional teachers, huge classes, learning in foreign languages and so on prevent large numbers of school attendees from even learning the basics. Around 250 million children are not learning basic skills, even though half of them have spent at least four years in school. 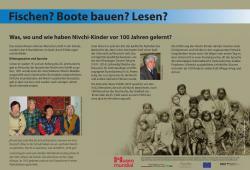 The following installation connects these facts on global education with the state of education for the Nivkh people. This is an ethnic minority in East Siberia whose cultural traditions and living conditions are displayed in the Museum of Nuremberg. The installation is comprised of information panels, schoolbook collections and worksheets for visitors. In the museum exhibition, there is a replica of a traditional Nivkh winter house. The installation is placed inside this winter house. It is a place for the whole family and also a place where children play, sleep and do their school homework. 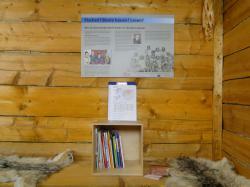 An information panel inside the house introduces the topic of education and links it to the Nivkh people. It explains what, when and where Nivkh children learnt 100 years ago. and it explains what happened to their native language in the national school system. Nivkh children faced many problems still prevalent today in many countries in the southern hemisphere. Nivkh children could not understand the Russian-speaking teachers and eventually lost their own language over time. The other parts of the installation focus on school education in other developing regions of the world. An exhibition-book shows some infographics on schooling and photographs of schools in Morocco, Papua New Guinea and Mali, three countries that figure prominently in the museum's permanent exhibition. A box with first grade schoolbooks from different countries around the world invites visitors to browse for themselves through different approaches to education. Finally, a worksheet encourages visitors to try out for themselves "learning to write" in four different alphabets. Installation measurements: exhibition board 540 x 800 mm; box 350 mm squared; and book approximately A4 size. Conjointly choose the object and topic you want to work with. The form of each tool depends very much on the specific museum you choose and its individual objects. Possible types of exhibits that could be connected to this development topic include children's issues, toys, the everyday lives of children or, alternatively, issues related to science or general knowledge. Choose an aspect of the topic that is both complex enough and well-defined enough. 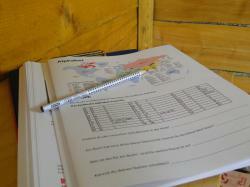 Do you want to offer an overview of progress on education worldwide? Or would you prefer to concentrate on a certain part of the story? If so, which part? Develop interesting methods for implementing your idea. Check how much space will be available at the museum, what technical facilities the museum can offer, which target group you want to address and how much money you have to invest. → Think small, start small. During the implementation process, new ideas will arise, so be prepared to hold back some money to invest later on! Develop a first draft of your idea, bringing together your ideas with those of your partners. This draft should already include a budget plan so that you can assess the feasibility of your idea. It should also include an implementation schedule. Produce a draft that everyone agrees with and send it to all partners. Ask for quotes for every stage of production. Try to get several quotes for each stage so that you can choose the best offer. Try to get recommendations on subcontractors that have already worked in museums. Add up the quotes, compare the total with your budget plan and adjust it, if necessary. Choose your working partners. Collecting is the key activity for this tool. You will need books and photographs. We asked friends, colleagues and language students to buy new or second-hand schoolbooks wherever they travelled. Do not forget to ask for receipts whenever possible. This makes it easier to give refunds, as well as providing an interesting opportunity to see the prices of schoolbooks in different countries, which also sheds further light on access to education around the world. Think also about the photographs that you need. In our case, we decided to focus on Mali, Papua New Guinea and Morocco, since these countries figure prominently in the permanent exhibition. Ask NGOs focused on educational projects for photos or, otherwise, you may rely again on friends and colleagues. Everyone we asked for help was happy to provide it. They liked the project and liked the idea of taking photos and buying books very much, since it took them to places they would not have seen otherwise. Bear in mind that collecting is a time-consuming process. Compose and write down the content for the information panel and the book. In order to produce a strong and logical link to the exhibition, we researched the state of education for Siberian minorities over the course of Soviet history. Ask your partners to proofread this first version so that you can clarify any misunderstandings at an early stage. Choose pictures and graphics that reinforce the content. Ask the copyright owners if you can use their material for educational purposes. In some cases, you might have to pay for the use of this material. There are many new, interesting and effective infographics produced by UNESCO. The Paris bureau is responsible for granting permission to reprint and to translate it. It is advisable to call them rather than wait for answers via the contact form on the UNESCO website. Permission is usually granted. Ask your colleagues and their children to test the worksheet. Is it clear enough for visitors to know what to do? Is it interesting enough for them to feel inspired to try writing for themselves? Finalize the information panel, book and worksheet. Ask your partners to do the final proofreading. Pay a professional proofreader if you have allowed for this in your budget plan. Send this concept to the designer. → Identify the representatives from the museum that need to give their blessing to the final product. Try to keep this circle small to save time. Ensure the correction process is transparent to all actors involved. Fix the information panel, set up the box and fill it with books. 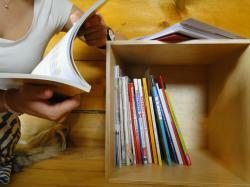 You will almost certainly "lose" some books. Make a list of them in order to keep track of any losses. Books that were especially difficult to obtain (reading books from Mali in our case) should not be left in the installation, but rather only be taken out for education programmes. The installation specifically targets children through the "alphabet worksheet". The tool is very well integrated into its surroundings. This is an up in the sense that it provides a very strong connection to the exhibition. However, on the downside, some visitors searching for this installation reported that it was hard to find it. The most difficult part of the ”education installation“ was identifying a focus because the topic is so wide. Think big, act small! Discussions over the focus were the most time-consuming.